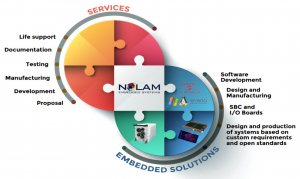 To complete our offer of global engineering, Nolam Embedded Systems can help you define the specification for your project. We also offer the possibility to develop drivers and BSP’s under real time operating systems LynxOS, VxWorks, QNX and under Linux Solaris and Windows 7/8 and if needed the software applications. We have strong manpower to even design Specific boards if you cannot find what you are looking for. Our engineers will be pleased to define all specification along with you.